The Century Arms PAR-1 pump-action AK's were plagued with performance problems related to their conversion to pump-action. I can't bring myself to find fault with Century for this however, because as far as I know, they were the first attempt at a pump-action AK and they were willing to sell it to Californians. On a side note, they are also importing the PAR-3 223 rifles, which I have no experience with. I can only assume they are similar. Apparently, Century found a bunch of PAR-1's and PAR-3's in a warehouse somewhere, as they're available again as of late 2007. The ones I've seen were still stamped '02 or '03, so I don't think any new ones are actually being built (unless perhaps they had the parts lying around and hadn't bothered to assemble them until now). They're also showing up at Big5 sporting goods stores in California now too (2008). Bolt carrier: In order to have a charging handle, it would be necessary to swap out the bolt carrier. This would also get you a gas piston, which you'd require for gas operation. The bolt itself is identical between AK's and PAR-1's, so you don't need a new one of these. Gas tube: The wooden fore-end would have to be removed and replaced with the original gas tube, as depicted below in the second picture down. Handguard: Typically, folks will want to use an AKM lower handguard, This will require cutting a small notch at the right spot on the barrel so that the AKM barrel retention system will work. This will also require pressing off the front sight post to slip the handguard retention ring onto the barrel. Fire control group and other 922(r) parts: On the 922(r) compliance page, you'll find an interactive parts list for 922(r) compliance. In a typical PAR-1, no US-made parts are present. This isn't a big technical complication, but it does raise the expense of the conversion considerably. In addition to these outright swaps, it would also be necessary to set up a means for the gas from the barrel to reach the gas tube. No matter how you do this, you will have to drill a hole through the barrel. If you're comfortable with removing and replacing the front sight block, you would drill a hole in the correct spot on the barrel before re-installing the front sight block. However, you could also simply drill a hole at an angle to go through from the end of the gas block and into the barrel itself, taking great care to keep it centered. It's significant to note that there's a hole drilled through the middle of the sight block where the gas tube is supposed to go. In order to circumvent this, you will have to install a steel (or other) tube of the correct diameter to pass through the hole. You'd also have to ensure that the tube is firmly in place, but not protruding through into the rifle's barrel. Because of the PAR-1's combined pump system / bolt carrier, the PAR-1 doesn't come apart exactly like an AK-47. In order to disassemble it, you must punch out the two pins on the pump handle. They're held in by a spring, and after the first couple of times they should not require more than finger pressure to pop out. Once the two pins are out, you can strip the PAR-1 just like an AK-47. I will not bother to describe this, as there are numerous guides on the internet which cover that just fine. When reassembling the PAR-1, it is necessary to reinstall one of the pins through the dangling loop on the extended bolt carrier. I have taken a picture of this, but who knows when I'll get it uploaded. When reinstalling the pin, you must get it through the holes of the pump handle as well as through the loop on the extension of the bolt carrier assembly. 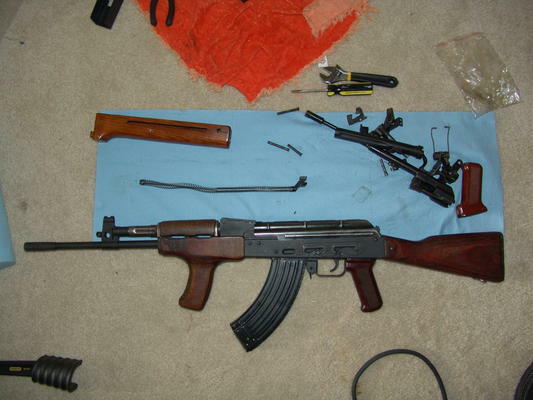 Other than this, reassembling the PAR-1 is the same as reassembling an AK-47. I have now seen several PAR-1 rifles which either had really bad welds on the rear sight base (located on the dust cover for these rifles), or had taken a serious hit in shipping which caused the welds to break loose. This caused the sight base to actually be loose on one side. The only fix for this would be re-welding the sight base. It's best just to check for this before buying a PAR-1 (or PAR-3). Pump Mechanism: First off, its pump mechanism doesn't always feed reliably. The rifle's design was built for the rapid motions encountered with a round going off, not the comparatively slow motions of a human arm. The slide should be brought back manually when cocking it, then let go to go forward on its own. Do not follow it forward with your hand, like the slide on a shotgun. Should you forget, the PAR-1's main spring will most likely reward you with an annoying double-feed which you must eject the mag to clear. Even when you bring it back and release it, the spring will sometimes do this (rarely though, in my experience). The problem is that the spring is perfectly tensioned to push forward the bolt and a gas piston, not a few extra ounces of material - namely, the pump handguard and the extra hardware that goes with it. 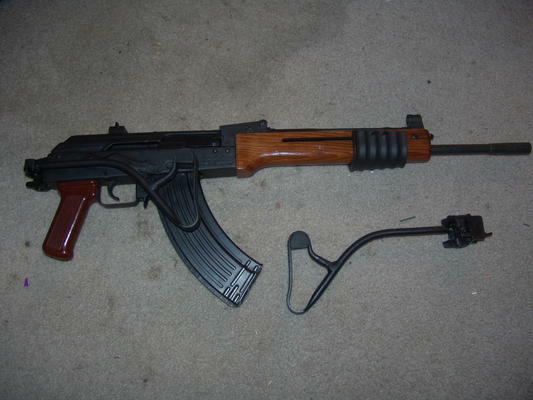 This could perhaps be resolved by using a stronger/stiffer spring than a real AK, however good luck in finding one. It would also make the rifle tougher to pump, which is a non-issue for most folks but would perhaps be an issue for women and/or smaller guys. I personally would find reliable operation to be a valid tradeoff, though. Lack of charging handle: I resolved the spring issue by removing the pump system and installing a standard AK bolt carrier. It also provided a charging handle, which the PAR-1 design is sadly lacking (and which made correcting jams even more irritating). A stock PAR-1 has no charging handle. There is no California legal issue with this modification, but you could potentially get hassled about it. Should it ever escalate past a few questions, I'm confident you'd get off. The gas port in the PAR-1's barrel is permanently blocked, and there's even a hole drilled through the middle of the gas block so that everyone can see that it hasn't been made operable. So, it's visually apparent that the PAR-1 is not gas operated, and I'm confident that this modification would only present a problem if someone mistook it for an actual semi-auto conversion. If you were to remove the rivet holding the piston into the bolt carrier and remove the piston, you'd be even more unassailable. That would eliminate the chance of someone thinking the PAR-1 has been converted to semi-auto. Another modification which I found useful, was a Romanian forward pistol grip. If you've replaced the bolt carrier, you may as well replace the forward furniture while you're at it. The Romanian forward pistol grip lower handguard allows you to use your left arm to hold the PAR-1 to your shoulder while your right reaches up to cycle the action. The major problem here, is that for some reason Century decided not to cut the notch on the top of the barrel which the foreend lock goes onto, so the pistol grip is only held on by wood tension with the front of the receiver. It comes loose semi regularly, and I still need to find a good non-permanent means of securing it to the rifle. This is my PAR-1 before swapping out the various parts from a Romanian 1965 parts kit. This is what the PAR-1 looks like after modification. The best part, for me at least, is that this configuration is entirely California-legal! This is what my PAR-1 looks like now. 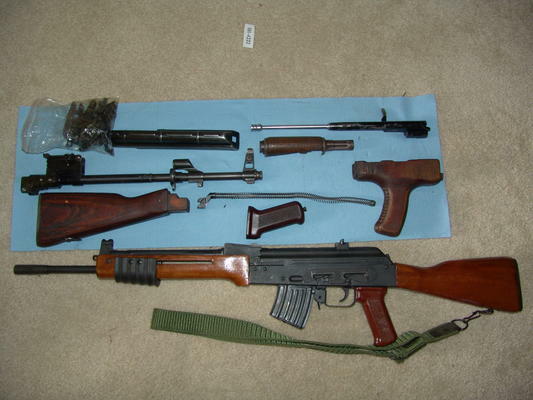 Still California-legal, with a Romanian side-folding stock (stock depicted on its own to the right). I ended up using the parts kit to build a semi-auto AK with.